I love to get dressed up almost as much as I love to eat. Dates, therefore, are a favorite of mine, particularly when they are with interesting people who also love to eat. And while every single date with my boyfriend is even better than the last, there is something to be said for putting on a cute outfit and going out to dinner with a friend. Moving to a new city means making new friends, so I’ve gone on a lot of friend dates since my arrival in Austin. Last Friday night, I went to dinner with Andrea, a woman who not only rocks every single outfit she wears but also really, truly enjoys a good meal. She’s an eats-the-free-bread-cleans-her-plate-doesn’t-refuse-dessert kind of girl, a.k.a. my perfect friend date. We decided to try NoRTH, the “rustic northern Italian” eatery at the Domain. Believe me, I was skeptical, and half-expecting mall food at its finest. In a mall it was, mall food it certainly was not. And for an Italian food snob like me, that’s saying something. 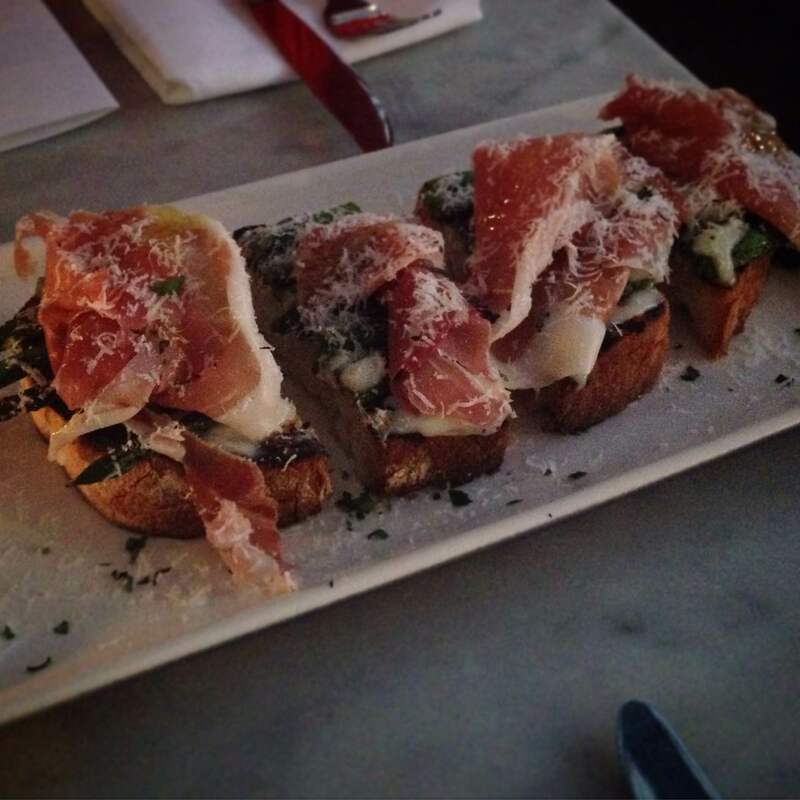 NoRTH’s bruschetta: grilled bread, asparagus, pecorino, proscuitto. Nom. My mother’s family hails from Italy, so my childhood was filled with the kinds of sauces and pizzas and homemade pastas that truly taste like they were made with love. Going to Italy last summer didn’t help, either. You try having a 27-year-old Italian guy make you and your sisters a carbonara with guanciale from his father’s butcher shop. It ruins you. Andrea comes from an Italian family as well so she, too, was skeptical. The sheer pinache with which NoRTH exceeded our expectations was mindblowing. Everything–and I mean EVERYTHING–was absolutely delicious. The bruschetta was first, a divine combination of thick-cut Italian bread, asparagus, good pecorino and fresh prosciutto. I’ll take it over tomato and basil any day of the week. We could have eaten it all night. Pasta was next. 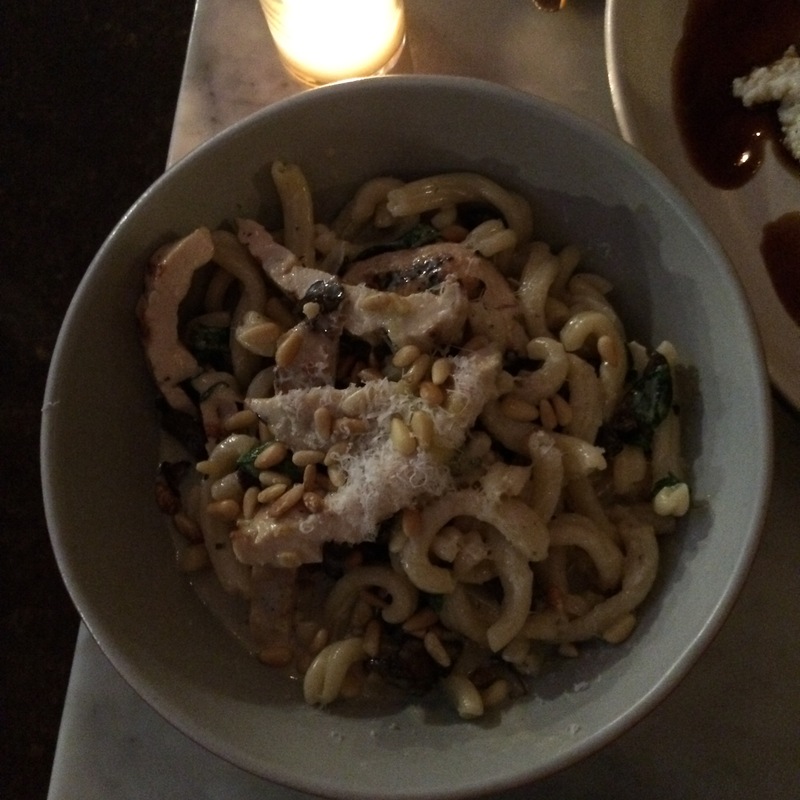 We chose the strozzapreti, their house-made tube-like noodle served in a creamy sauce with mushrooms, grilled chicken, spinach and pine nuts. (Side note: pine nuts make everything better and should be less expensive so that I can constantly have them in my cabinet). The dish was flavorful and full of texture; the mushrooms and the light cream sauce melded together subtly and beautifully; the noodles were plump and held the sauce well. The pasta dish also paired well with the entree we ordered, a hefty portion of short ribs with creamy polenta and delicate broccolini. The short ribs melted in my mouth; the polenta was cooked well and just basic enough in flavor to not overpower the red wine flavors from the beef. If only I had my badass food camera (still on the way) to capture these gorgeous things. Swooning from the goodness, we just couldn’t refuse dessert from our (very attentive) server. The olive oil cake was dense and citrus-y but also, somehow, very light. It was surrounded with sugar-soaked oranges and strawberries and topped with a simple dollop of mascarpone cheese. Jesus. It was perfect. When the bill arrived at the end of our feast, the appetizer AND dessert had been comped. One way that a date with one of your adorable girlfriends trumps a date with your boyfriend: sometimes, flirty waiters give you free stuff.